Better late than never...holiday goody bags — Mel bakes things. I am fully aware of how late and seemingly irrelevant this post is...but good news: everything in this post, while obviously Christmas/winter themed, is totally adaptable to Valentine's Day. Translation: need fun things to give your friends and family for the most polarizing holiday ever? You've come to the right place. Side note: if you're one of those people that likes to audibly complain about how much you hate Valentine's day and how it's a Hallmark holiday, shut it. Similarly, if you're one of those people who gushes on and on about how romaaaaantic it is, also shut it. Love it or hate it, the core message of the holiday is to show people you love them and perhaps do something kind for them. It doesn't even have to be about the holiday itself, you should just do nice things for people because you can. And now you have a reason to. Nothing wrong with that, is there? Every year, in early December, I set aside one weekend to have a baking extravaganza. Because really, when you're trying to make 5+ kinds of cookies to gift to 10-20 people, you need a whole weekend (or at least most of one) to get it all done. It's a cheap and fun way to be able to give gifts to the people you care about, and as I've said before, I've never encountered anyone who scoffs at homemade gifts (especially edible ones). Packaging your goody bags is easy, too. Target and Michaels (or your local craft store) both carry cellophane bags, cookie/cupcake boxes, etc that are pretty inexpensive. Etsy is a good place for that stuff, too. These take so little effort, and yield such a beautiful result. Got a bag of pretzel rods? And a bag of chocolate chips? You can make these. Add fun sprinkles, because they look so much cooler that way. I always leave a little bit of the pretzel uncovered by chocolate, sort of like a handle. That way, nobody has to get melted chocolate all over their fingers. Although, would you really be one to complain if that happened? These are, by far, the thing I get asked to make a million times over. You can't see it here, but I cut them in small pieces (not the way listed in the recipe), and individually wrap them in parchment paper. I was able to fit 6-8 caramels in each of these little boxes (found on Etsy). If you cut your caramels into squares, instead of rolling them like Ina suggests, you can probably get 50-75 caramels from one batch. Minus whatever you eat along the way. Because you will want to find reasons to "taste-test" these at least 5 times while you're cutting and wrapping them. You can find the recipe at the Food Network. I make small tweaks to it, but it's a great starting point. I have posted before about my new, somewhat strange, love of playing with royal icing. It takes a crap-ton of time and experimenting, but the results are too pretty and unique to pass up. Also, it's not as hard as it looks, but people will think you went to extreme lengths to make these gorgeous cookies. You'll get all kinds of props and street cred for it. Obviously, these are easily adapted for any holiday (or non-holiday). It's up to you what cookie cutter shapes you use, how you ice them, etc. I've made triangle-shaped cookies like this before. Still a big hit. Although i made the perhaps questionable judgement call of using solid yellowy-orange icing on some of those triangles, which sort of made them look like pieces of cheese. It was weird. Anyway, these also went into my goody bags this year. You can find the recipe here. Ahh, the mighty snowball. You may also know them as Swedish Heirloom Cookies, Russian Tea Cakes, Mexican Wedding Cookies, or nutballs. Seriously, how many names can one cookie have? These seemed to be a big hit this year, too, and they actually are the one consistent cookie I have made (or helped make) every Christmas since I can remember. The recipe I have is from my Grandma, so I'm not sure I want to share it, but Emeril has a similar one here. The one tip I will give you: use almonds, and toast those babies in the oven first (but make sure they're cool before you put them in the dough). It makes all the difference in the world. I posted about chocolate chip cookies a week or two ago, so I don't have much else to say about these. 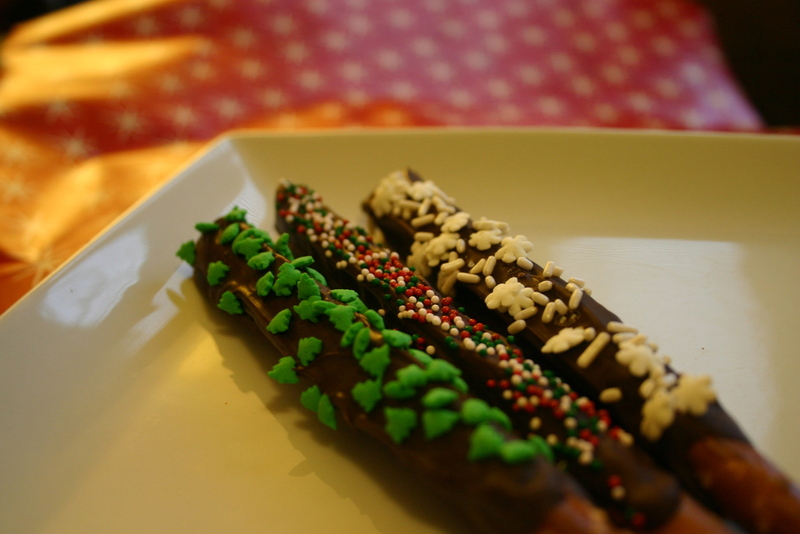 They are delicious, and they are wintry. The addition of the Andes mints throws people for an unexpected loop (in a good way). Since people have such strong opinions about how they like the consistency and flavor ratio of their chocolate chip cookies, you can use any recipe you want for this.